Tablets are basking in well-deserved attention and manufacturers know they need to try hard and make their devices distinct and memorable. Truly unique gadgets are hard to come by these days - especially in Honeycomb land. Which is perhaps part of the reason why iPad is still the one to beat. The Samsung Galaxy Tab 10.1 3G is in for a challenge, and up for it. Shortly after launch the Galaxy Tab 10.1 was blessed with a custom user experience, called Touch Wiz UX, which literally puts more color into Honeycomb, offers a good selection of customizable widgets and most importantly tries to ease your way into Android for tablets. Yet this tablet’s main advantage remains that it’s the most portable 10” slate to hit the market. It's thinner even than iPad 2 and good 42 grams lighter than Apple's frontrunner, while still promising to match its battery performance. And that's no mean feat since tablets are going hard after netbooks, so they need to back their portability with battery longevity. The Galaxy Tab 10.1 has a dual-core NVIDIA Tegra 2 processor, a bright 10.1" PLS TFT display of WXGA resolution, a premium set of connectivity options and plenty of storage space. Check out the full list of things going for (and against) the Galaxy Tab 10.1 3G below. 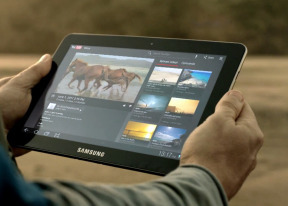 Samsung are bringing their A game in the Galaxy Tab 10.1. Not that it should be judged by sheer size but the company's biggest tablet is fit to be in charge and meet the competition head on. Whether it's watching films, browsing the web, gaming, video-calls, or imaging, this is one of the best-equipped tablets out there. The screen quality, the added TouchWiz UX functionality, the good battery and excellent media make it a must-see. The whole package looks like the right mix of style and substance, but we just won't rush to a verdict. The Galaxy Tab had a promising start in our preview. With all the finishing touches in place, it's ready to give its best. Head on past the break to see what the Galaxy Tab 10.1 is made of. Why when I charge my tab, do I have to switch it off. It won't charge otherwise. To all of you guys moaning about data counting,try Data Booser,works great on my 10.1 gingerbread3.2.i love what u can do with this machine kicks isad arse.